Sound Connections Programme Managers, Julia Roderick and Jennifer Raven, spent an afternoon working with GMS staff exploring what evaluation is, why it is of value to different stakeholders, what the best evaluation frameworks are, and how to create practical and meaningful evaluation tools. There was also time to consider how to ensure evaluation is relevant and beneficial to participants. 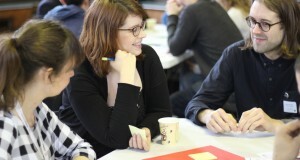 If your team or organisation would like a team training session to equip you with all the essentials of evaluation, please contact jennifer@sound-connections.org.uk.